Are you hungry for a sweet treat? 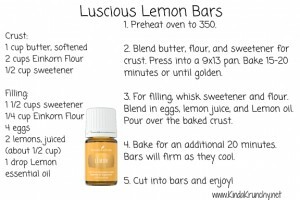 Try Young Living’s Luscious Lemon Bars! This recipe comes in their cookbook you get when you purchase their Einkorn flour! I am so excited about Einkorn flour — more on that later! Check out our new family favorite! Want to start on the path to health and wellness through essential oils?! I would love to help you on your oily journey! Check out how to become a member and join our oily family! This entry was posted in Healthy Eats. Bookmark the permalink.